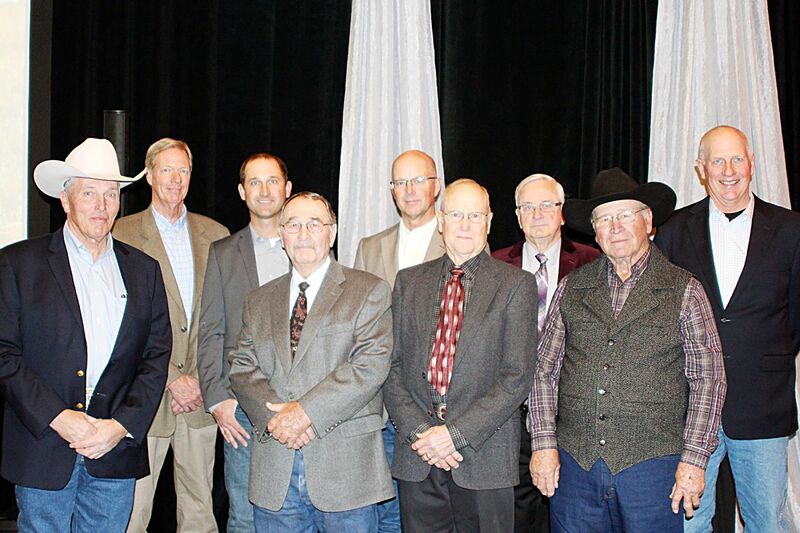 (back row, L to R) are Don Musil, Musil Farms, Blue Rapids; Andy and Raymond Larson, Larson Farms, Green; Roger Caudle, Atchison; Jim Musil, Musil Farms, Blue Rapids; (front row, L to R) Mike Samples, Farmers & Ranchers Livestock, Salina; Philip Phar, Council Grove; Arlan Stakley, El Dorado; and Dennis Huck, Coldwater. WICHITA, Kan. — Nine Kansas Livestock Association members celebrating their golden anniversaries with the organization this year were recognized during the KLA Convention Nov. 29. KLA currently has 104 members who have been loyal to the association a half century or longer.